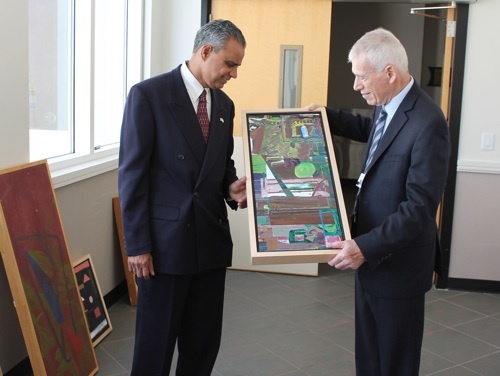 Assemblyman Upendra Chivukula, left, and Steve Proctor, Matheny president, admire an untitled painting by Arts Access artist Michael Martin. New Jersey Assemblyman Upendra J. Chivukula (D) recently visited Matheny to familiarize himself with our mission and to better understand the needs of people with disabilities in the state. Touring the entire Matheny facility, the assemblyman finished up in the Robert Schonhorn Arts Center, where he learned about Matheny’s unique Arts Access Program, which enables people with disabilities to create fine art, assisted by professional artist-facilitators. Chivukula, who is deputy speaker of the Assembly and chair of the Telecommunications and Utilities Committee, is running for Congress in New Jersey’s Seventh District, opposing incumbent Rep. Leonard Lance (R). Chivukula was elected to the Assembly in 2002. This entry was posted in Uncategorized and tagged Arts Access, Upendra J. Chivukula. Bookmark the permalink.